The Windows Vista set-up DVD may be used to restore your PC back to a previous state using a backup previously made with AISBackup. The restore supports backup's made to CD/DVD, local drives, external drives and networked drives including FTP. You must have a copy of AISBackup version 2.7 or higher on CD or a USB flash drive. You may copy AISBackup to CD using the menu option Tools / Extra Tools / Copy AISBackup to CD (For use with Vista set-up DVD). To copy AISBackup to a USB flash drive use the menu option Tools / Extra Tools / Copy AISBackup to Flash / USB Drive. It is recommended that if you manually copy AISBackup to a flash drive that you copy it to the root of the drive to make finding AISBackup easier when running from the Vista set-up DVD. 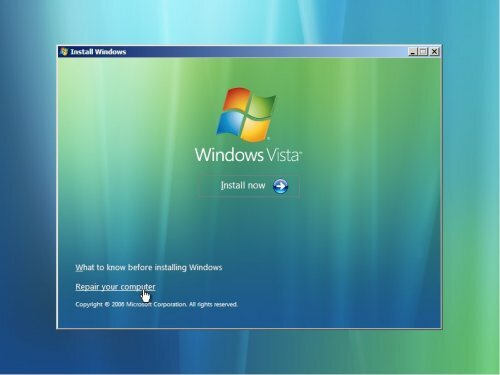 Here are step-by-step instructions for using the Windows Vista set-up DVD with AISBackup on CD to restore a copy of Windows Server 2003 to a new unformatted disk. Once the PC has booted the Windows Vista set-up DVD may be removed from the drive to enable AISBackup to be loaded from the CD. After AISBackup has loaded it copies itself from the CD so the AISBackup CD may be removed to facilitate restores from CD or DVD. In this example Server 2003 is backed up to DVD. 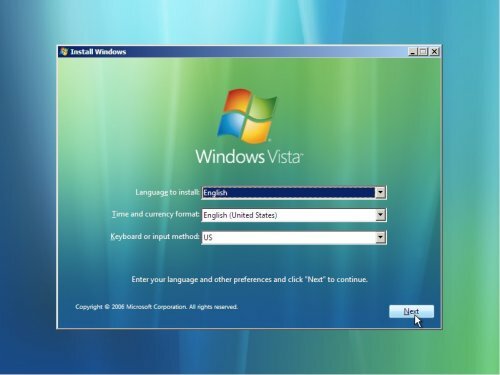 Insert the Windows Vista Boot DVD and restart your PC, when the Language selection form is displayed you may remove the DVD and replace it with the CD containing AISBackup, unless of course AISBackup is on a USB flash drive. Choose your language and keyboard option then click Next to proceed.